The European Commission has published proposals aimed at reducing vehicles' carbon dioxide (CO2) emissions by 2030. "The proposed 30% reduction target for passenger cars is ambitious and realistic," the Commission said. Any changes would not be binding on the UK if it was no longer in the European Union. The Commission acknowledged that the technical changes needed to achieve the new targets would mean higher production costs and that would, in the short term, lead to higher vehicle prices. It calculated that for an average new car registered in 2030, the additional manufacturing costs would be about €1,000 (£883). For an average 2030 van, they would be up to about €900. "However, these additional costs are significantly lower than the fuel savings from which consumers will benefit over a vehicle's lifetime," the Commission said. The Commission said the incentives for manufacturers to produce more alternative vehicles were designed to boost the EU's competitiveness in the global car manufacturing market. "The EU automotive industry risks losing its technological leadership in particular with respect to zero- and low-emission vehicles, with the US, Japan, South Korea and China moving ahead very quickly in this segment," it said. It noted that China had recently introduced mandatory zero- and low-emission vehicle quotas for manufacturers from 2019, and that some US states had established a "regulatory instrument to enhance the uptake of zero- and low-emission vehicles". Internal Market Commissioner Elżbieta Bieńkowska said the EU's car industry was "at a turning point". "To maintain its global leadership, and for the sake of our environment and public health, the car industry needs to invest in new and clean technologies," she added. The proposals would also see the Commission making up to €800m available to go towards improving charging infrastructure and €200m for battery development. EU governments and the European Parliament will need to agree to the Commission's proposals. Environmental campaigners and consumer advocates seem pretty unimpressed by the Commission's proposals - even though the proposed limits on CO2 emissions are considerably lower than what we have today. That's partly because the proposals don't include minimum quotas for the production of zero and low emission vehicles - hybrids, electric cars and hydrogen vehicles. There will be incentives for manufacturers to meet specific targets, but no penalties if they fail. If Brussels gossip is to be believed, the proposal was watered down due to high level lobbying from Germany's car industry association, the VDA - which found sympathy in high places, particularly among German officials. So is the Commission's plan worthwhile? Well, the industry is currently working towards an earlier stage of CO2 emissions targets, due to come into force in 2021. When adopted, these were also derided as being too weak. Nevertheless, they have been widely credited with encouraging major carmakers to develop a range of new electric and hybrid models. And if carmakers are building them, then they will want us to buy them. 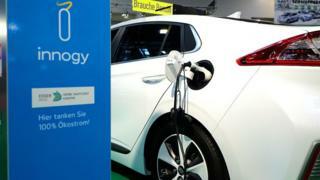 Sales of electric vehicles and hybrids in Europe are already increasing rapidly. The chances are the proposals, if adopted, will only accelerate that process, but perhaps not as quickly as some might have hoped.